Manzil Healthcare Services observed “Wear it Pink Day” on Thursday the 18th of October 2018 across all in centers in the GCC as part of its effort to raise awareness about Breast Cancer and to stress the importance of prevention through early detection. The employees of Manzil Healthcare across all its centers showed up to work on 18th October in Pink attire to pledge their support for the breast cancer awareness campaign. They also participated in various programs including Breast Cancer Awareness talk and Breast Self-examination. All the centers of Manzil Healthcare Services were decorated in pink and a signature campaign was also organized where people could take a pledge to fight Breast Cancer. Speaking about the campaign, Dr. Sarper Tanli, Group CEO of Manzil Healthcare said: “This small gesture from Manzil Helathcare to Wear Pink is aimed at tackling a serious problem of Breast Cancer that women around the world are at high risk. We are committed to raising awareness in the honour of all the survivors and we are dedicated to educate and encourage women that early detection of Breast Cancer can save lives. 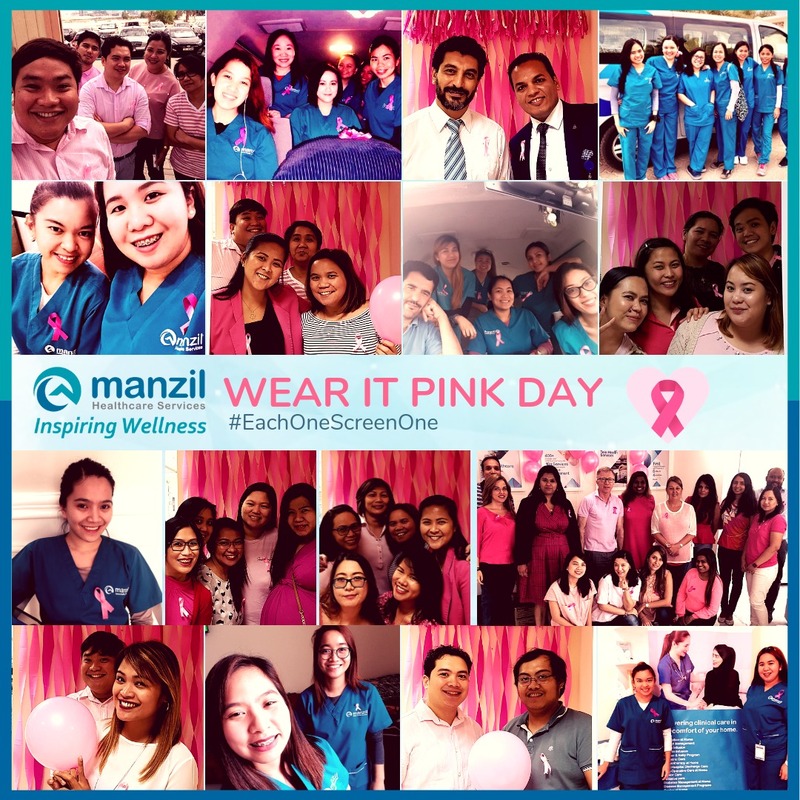 In addition to observing the global “Wear it Pink” Campaign, Manzil Healthcare also launched the #EachOneScreenOne campaign encouraging every woman to get a screening for Breast Cancer and also get one more woman along for the screening. The campaign also included the screening of other chronic diseases like diabetes, heart disease, cardiac diseases as a step towards preventive care. Breast Cancer is an appalling disease that continues to grip millions of women around the world. In a global effort to raise awareness about the disease and importance of early detection, October is observed as Breast Cancer Awareness Month as a worldwide annual campaign to highlight the importance of breast cancer awareness, education, and research. Like many organisations across the globe, Manzil Healthcare Services took part in the campaign to pledge its support towards awareness and the fight against breast cancer.